Some well-known locations are sporting new decorations this week. 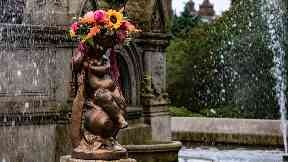 One of Glasgow's best-known landmarks has been given a floral makeover in an audacious move by a local florist. 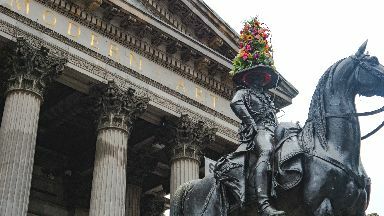 The Duke of Wellington statue on Royal Exchange Square is famous for the ever-present traffic cone perpetually perched on its head. This week, though, the duke's headgear sports an altogether more fetching arrangement thanks to florist O'Banion's. O'Banion's, which describes itself as "the most badass florist in Scotland", decorated the cone with a colourful boutique in a guerrilla operation carried out in the dead of night. As well as the statue, spots along Buchanan Street, Kelvin Way Bridge and the fountain in Kelvinbridge Park were also given floral decorations overnight. The arrangements were the brainchild of O'Banion's head honcho, Maddie Gold, who named her new business after notorious gangster Dean O'Banion - who ran a flower shop as a front for his nefarious activities in 1920s Chicago. Ms Gold said: "Dean was the leader of the infamous North Side Gang operating in Chicago in the 1920s. He was a key rival of Al Capone, a successful bootlegger running illegal alcohol into the US throughout prohibition and he was also a talented florist. "Based in Glasgow, we are just as particular about our work as Dean was. We also hope to meet a better end than O'Banion, who was shot when Capone ordered a hit on him on November 10, 1924.